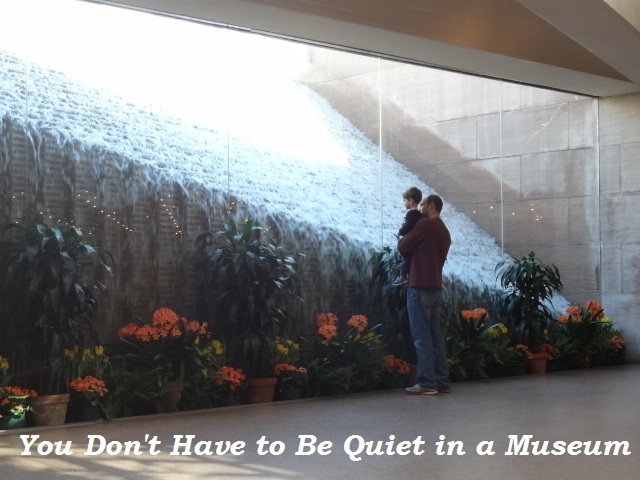 That’s right, I said it…you don’t have to be quiet in a museum. This is one of the most persistent myths I hear about, that museums need the same reverent silence expected in most houses of worship. It isn’t true! Now, do museums need to be treated with respect? Yes! Do you need to take into account the experience of others? Absolutely! In a museum there ARE certain expectations, first and foremost probably being don’t touch the stuff you aren’t supposed to touch. However, nothing in there says you stay still and silent through the visit. Talking with each other is one of the best ways to experience a museum. Ask questions, point out things you notice, giggle at the silly looking portraits, give each other “I Spy” mysteries to unravel. Even my 1 1/2 year old loves to look for “two hats” or “paintings with apples” and finding all of the animals in a room can keep you busy together for a while. If your little one gets a bit too excited and shouts something out, that’s ok. You can help them learn the “museum voice” they need to have, even if it takes a little practice. Let them move, within limits. If you are in a room full of Degas’ portraits of dancers…ask your little dancer to imitate the pose. If there are instruments, ask them what it would look like to play them. With animals you can imitate the posture and walk. Obviously, you know your child and whether they can follow directions to make you feel comfortable doing this. Keep an eye on your surroundings…you don’t want to bump into people or priceless works of art…but if there is the space then use it. Use media to add to the experience. I love bringing books to read in a quiet corner (they can also become the basis for a scavenger hunt). Little artists might love to sketch in a notebook (pencil only please, to protect the objects). You could also use digital technology to look up things by the artist, access clips of movies or music to add to what you are seeing. Take pictures (if it is allowed), better still let your KIDS take pictures and make them tell you why they wanted that particular shot. As long as you aren’t disturbing other people’s experience in the gallery, what does it hurt? A large percentage of families I’ve talked to shy away from going to the museum with their young kids because of this perception that “youthful exuberance” will be unwelcome. Well, it is true, you might get a raised eyebrow from someone…just like you do at the grocery store or anywhere else in public. I just don’t want that to stop you from visiting and enjoying your time there. This entry was posted in Blog, Kids in Museums and tagged art, exhibit, modern art, museum professionals, museums with kids, preschool, quiet, teachable moments, toddler, visiting museums. Bookmark the permalink.